BUSHENYI – The National Water and Sewerage Corporation (NWSC) has extended water to two villages in Bushenyi-Ishaka Municipality. 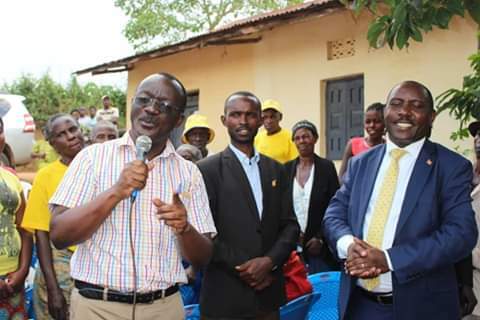 The NWSC Managing Director, Dr. Eng Silver Mugisha, Bushenyi-Ishaka Municipality MP Arinda Gordon and area stakeholders on Thursday commissioned the water mains extensions in Kyabumbaire and Kibaare villages. Speaking at the commissioning ceremony, Dr Mugisha shared that the 2kms and 9kms water mains extension to Kyabumbaire and Kibaare villages are line with the SCAP 100 programme. He said that the NWSC sells the jerrycan of water at 25 shillings. “We recommend that water vendors sell a jerrycan of water at only 50shs. Dr Mugisha appreciated the residents for the cost-sharing initiative. The residents offered to dig trenches for themselves which made pipe laying easy. “We applaud the residents for the warm reception and cooperation while we worked to extend the services”. MP Arinda lauded NWSC for successfully implementing Government programmes. He advised the residents to use water to improve their lives and health. The Government of Uganda through National Water and Sewerage corporation launched the Service Coverage Acceleration programme aimed at extending services to over 12,000 villages across Uganda by 2020.